I've returned with a vengeance to reading on a regular basis as it's enjoyable and provides a great escape. 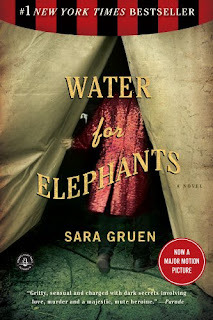 I was at the library, looking for one book and ended up leaving with five and Water For Elephants by Sara Gruen was one of them. I had no intention of picking this up initially but it was in the "Book Club" section; I've always wanted to be a member of a book club. I thought if this was selected for a book club which meant it produced great discussion, then it was good enough for me. This book did not disappoint. Essentially it's a book about animals while working at a circus. This was a whole new world for me, but the story is told from the point of Jacob Jankowski who is now 93 in an assisted living facility. After a traumatic life event at 23, he finds himself at the circus while trying to find himself. So from this vantage point, it is understandable as the character and the reader learn the ways of the circus. It's also a story about animal behavior. Rosie the Elephant is almost human in how she is portrayed and it isn't a stretch to imagine her feelings dealing with the ringmaster and others. This is a well-written story with well-defined characters set in post-depression America. But ultimately this is a story of love, that encompasses domestic violence, poverty, and animal rights; and finding yourself while being thrown into unexpected circumstances. If you're an animal lover - the story line will appeal to you. Even if you're not, the overriding story reinforces that love always wins. I have not seen the movie, but my daughter did. Based on what she told me it seems pretty close to the book but I'm sure as with any other movie creative license is taken. Reese Witherspoon was Marlena; she said it was a good movie.